Graphite machining most commonly uses synthetic graphite materials to fabricate parts and products through extrusion and molding. Synthetic graphite is produced by adding tar pitch and petroleum coke to natural graphite during heat treatments. Graphite is an abrasive material, and this should be taken into consideration when deciding upon which tools to use in the machining process. 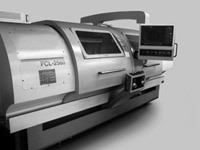 Most manufacturers will have CNC milling and lathe machinery, as well as band and carbon saws. Machined graphite can easily reveal surface defects produced during the fabrication process, and therefore it is important to use quality tools and processes. Compressed air, or air circulation systems can be used to help reduce the amount of graphite dust in a manufacturing facility. Much of it is produced on the tools and work surfaces of graphite machining for electrodes, tubes and rods, and it can create an unpleasant working environment. Custom specifications can be met, and graphite products can be purchased sealed or unsealed. It is a porous material, and therefore for applications requiring contact with water such as graphite anodes and some graphite bearings uses, sealing the material with a wax, resin or oil will prove to be a worthwhile investment. The natural form of graphite, termed carbon graphite, is the most stable form of solid carbon, and has properties of both a metal and a semi-metal including electrical conductivity and thermal conductivity. Although machined graphite is more expensive than pure graphite, it is much more structurally sound and reliable and is able to be used in industrial applications such as crucibles, boats and automobiles, aluminum processing equipment, glass handling and furnace parts. Other types of graphite referred to when manufacturing products such as these include carbon graphite and EDM graphite. Graphite is able to maintain its structure and thermal conductivity even at temperatures reaching 5000°F and is commonly used for electrodes in arc steel furnaces. The tool and die process is commonly used to machine graphite into a variety of forms. The synthetic graphite is heated until it has softened enough to be poured into molds and dies. Once the substance has cooled and set in the form of the mold, it can be removed and finished. Advanced tool coatings are recommended in graphite machining processes as tools are often worn out easily by the abrasiveness of graphite’s surface. It is a brittle material that can be complicated to manufacture, but it also very useful to many industries. Machined Graphite Graphite machining is able to produce a wide range of graphite and graphite composite products for use in industries including automotive, aerospace, chemical, metallurgical, nuclear and electronics.